The Place Private home dining is all the rage these days and looks set to be the latest food trend in 2018. I was excited to check out my first private home dining experience at Lucky House Cantonese Private Kitchen (陶然居), all thanks to a fellow foodie who managed to secure a table for the eight of us about three months in advance. Lucky House is located at 267 Upper East Coast Road within a terrace house. 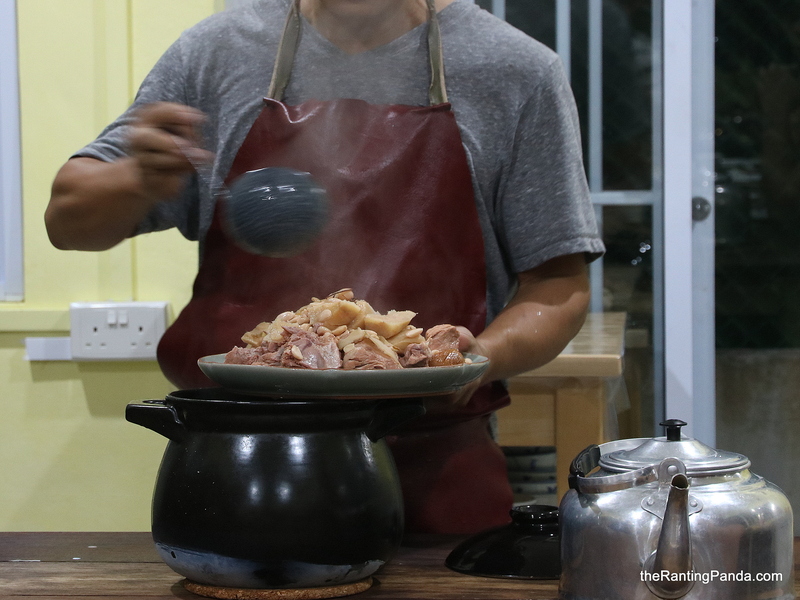 The kitchen is run by Chef Sam Wong, a self-taught home cook and a fishing enthusiast who has been running his home based kitchen for the past two years. Check out some of the other Private Home Dining Experiences we have checked out so far! The kitchen where we had our meal is huge, with a long wooden table that easily fits 10-12 diners, as well as a spacious and rustic looking backyard area where chef does most of his cooking. The Food Priced at S$80 nett per pax, we had a total of 8 dishes during our visit. From what I understand from chef’s illustration of the dishes, minimal seasoning is used to retain the original flavours of the dishes. We started with the Charcoal Boiled Pork Shoulder with Arrow Root and Peanut Soup, which has no pepper and seasoning added. This soup is boiled for 11 hours, with a very clear and refreshing flavour. Huge chunks of pork shoulder meat is added to boil the soup, where I also tried bits of the tender pork. The meat dishes are definitely the forte of Chef Sam. Take the beautiful Concubine Chicken for example, one of the most pretty looking roast chicken I have seen. The chicken meat is very juicy. We also had the Fried Prawns with Rose liqueur and the Steamed Wild Caught Red Garoupa Shifu Style. I definitely prefer the fresh flavours of the garoupa more, which is light in flavour but that is also when I can appreciate the fresh water flavours of the fish more. One of my favourite dishes is the Crayfish Omelette, decorated with the shell fish where the egg is fried with generous chunks of crayfish. Simple, yet luxe. Of course, we can’t leave Lucky House without trying the Lucky House Roast Duck! This is one of chef’s signature dishes, where the duck is marinated for two days, followed by being sun-dried for a day, before finally being roasted in the charcoal oven. The texture of the duck is slightly charred, with a strong smoky flavour and tender duck meat. Go straight for the charred skin! The last savoury dish we had is the Fried Organic Vegetable, a simple plate of greens without much seasoning but nevertheless tasty on its own. For desserts, expect homestyle fare like the Shandong Peanuts and Kidney Beans. Rants If you are driving, parking is a challenge as the property can accommodate at most three cars on site. That said, there is an option for free parking at the nearby Evergreen Gardens. You also need some luck with a dining slot too, and be prepared to reserve a few months in advance too as there are only weekday night slots at the moment. Will I Return Again? For S$80 per person, I tried 8 dishes and it is definitely an interesting dining experience for me. While you do not get restaurant level service or Michelin food standards, the home cooked fares, flavours and home dining experience are unique and not replicable elsewhere. That is truly what you are paying for. Kelvin didn’t go? I didn’t see him in the photo! Haha he wasn’t lucky enough and had to skip that meal!